This month State Archives volunteers completed the re-housing of 137 boxes of Ramsey County District Court criminal case files dated 1858-1930. The documents were contained in over 13,000 file envelopes, and housed in boxes. The records were received many years ago, and were difficult for our researchers use. Starting in August 2017 our volunteers removed the documents from the envelopes, unfolded the documents, and cut from the envelopes any relevant information. Each case file's documents were placed in bond folder, and then several bond folders were housed in an archival quality folder. The old boxes were discarded with the documents then housed in our boxes. Now that the Ramsey County District Court criminal case files are unfolded and housed in archival quality folders their preservation is prolonged. And researchers can now easily use the documents without opening a dirty envelope and unfolding the documents to view. The unfolding and unfolding of the documents eventually would damage even the high quality paper documents. Early in the project our volunteers found 3D objects like wallets, coins, bullets and more that were evidence in the criminal cases. The practice of including evidence in the case files was eventually discontinued, and only a few 3D objects were found. The case files are accessed using a name index that was created by the court at the time the case files were created. We have two groups of State Archives volunteers. The first group of 8-10 volunteers work two mornings a month. The other group of 10 volunteers are from the Women's Organization of the Minnesota Historical Society (WOMNHS) and work one morning a month. We're very grateful to our volunteers as they help us better preserve and provide improved access to the collections in the State Archives. Next project? A mere 92 boxes of Fergus Falls State Hospital commitment papers dated 1890-1967 which are tri-folded in envelopes. Stay tuned for updates! Earlier last week, a group of 3M employees from their Native American network volunteered their time for MNHS. They put together 2,000 bandolier bags in just 30 minutes! These bags will be mailed out to teachers across the country. 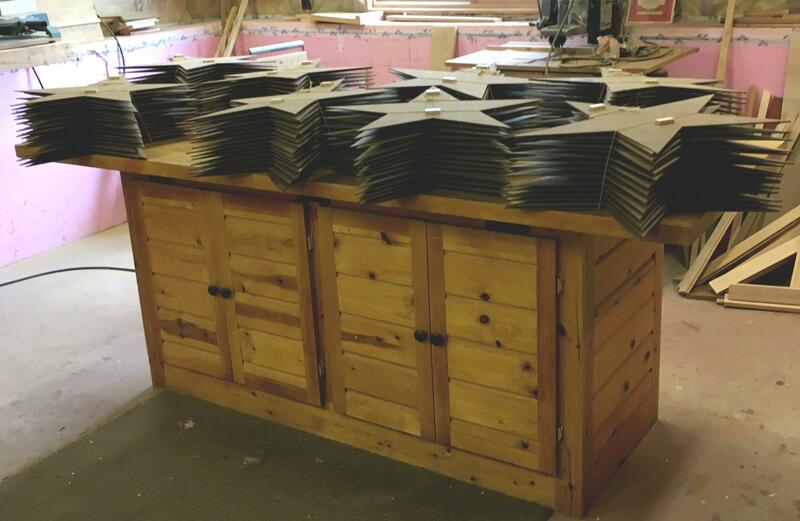 They also painted lettering on 70 stars that will be used for the First Avenue Exhibit opening. The Women's Organization of MNHS finished painting the stars yesterday! One of our long-time volunteers, Skip, cut and whitewashed the stars himself. Thank you, 3M employees and Skip! MNopedia volunteers and interns have published fifteen articles so far this fiscal year, with a several more in the works! MNopedia will be able to launch Phase I of the Minnesota Place Names project as scheduled by the end of June, then it will be on to Phase II: Lakes, Rivers, and Streams. So, for the countless trips they took down the History Rabbit Hole and their many valued contributions to MNopedia . . . Thank you, MNopedia volunteers and interns! 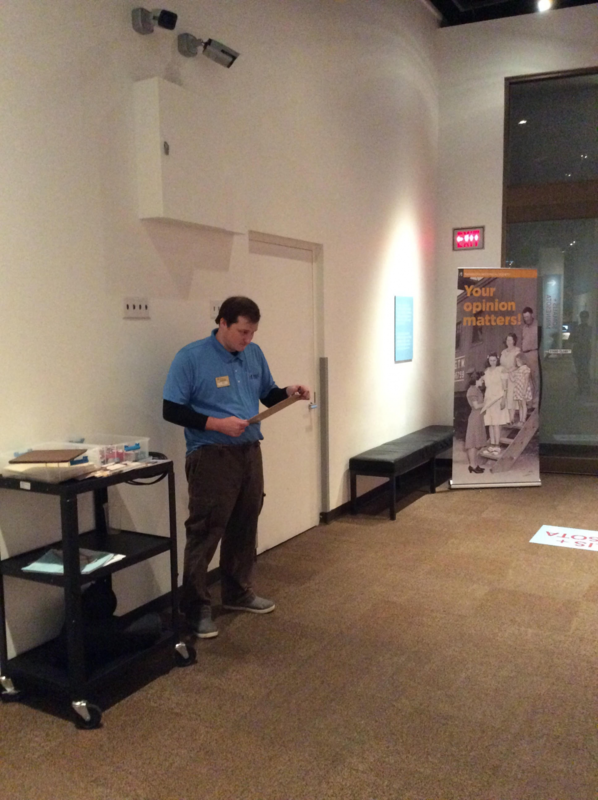 The Minnesota Historical Society’s Special Events team helped make the MLK Weekend activities at the Minnesota History Center a success. 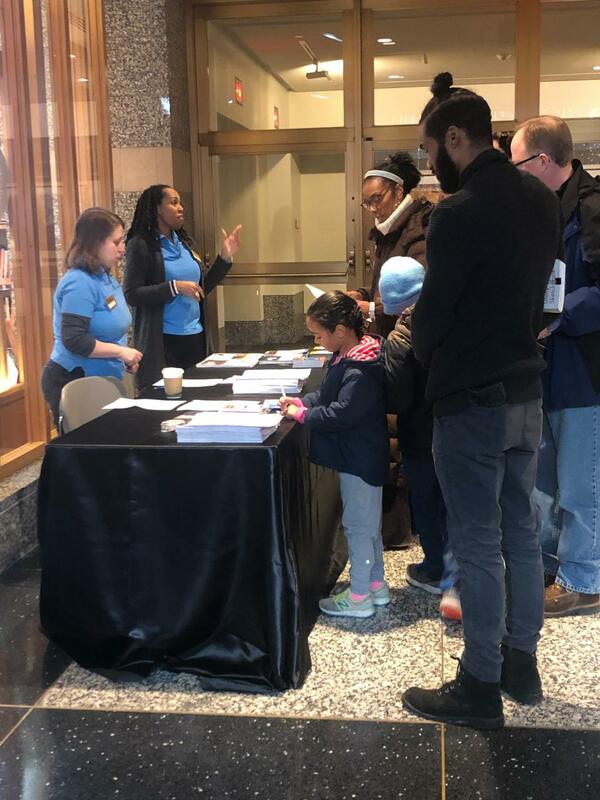 6 volunteers assisted with registration, ushering, wayfinding, snack rooms, and service projects for the Together We Sing Festival on Saturday, January 19. Thank you, volunteers, for helping make the event a success! The passion and energy of MNHS volunteers and interns is like no other, and they consistently do their best work to accomplish and support the mission of MNHS. In the last year, volunteers and interns contributed 53,400 hours to the work of MNHS. MNHS volunteers contribute their time and talents 362 days a year, typically only taking off three major holidays: Thanksgiving, Christmas, and Easter. 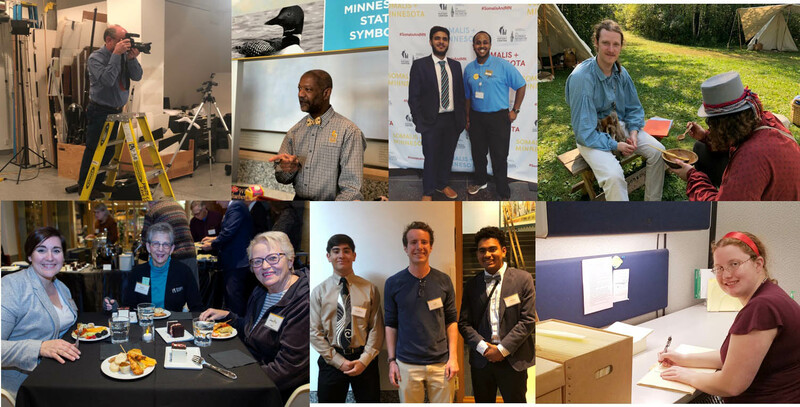 In the last year, Minnesota Historical Society volunteers and interns surpassed an incredible milestone of 1 million hours since 1992. During that time, some volunteers have even served more than 25 years! At the Volunteer & Intern Recognition Event in November 2018, volunteers and interns were recognized for their work, talents, and years of service. Volunteers and interns filled the 3M Auditorium to hear Phyllis Goff, Immediate Past President of the Executive Council, and Kent Whitworth, Director & Chief Executive Officer, speak. Afterwards, volunteers and interns were able to enjoy the company of one another, as well as MNHS staff and members of the MNHS Executive Leadership Team and MNHS employees through Collections Tours, a discussion about the upcoming exhibit First Avenue, led by MNHS staff member Erin Cole, and a social hour. Thanks to all who made this a successful event, and thanks to MNHS volunteers and interns for your contributions, commitments, and efforts to live out the mission and values of MNHS. Somalis + MN Intercept Survey volunteers, or the “Data Squad,” were busy this fall collecting data from Minnesota History Center visitors. Volunteers easily reached the goal of 383 responses, and continued to exceed that goal by collecting 404 responses total! Volunteers also provided valuable feedback about the exhibit and to enhance visitors’ experiences. 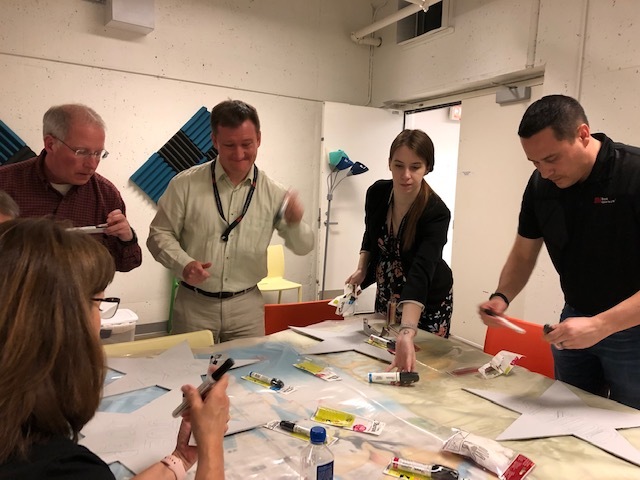 A couple of volunteers also brainstormed with MNHS Strategic Communications staff to develop posters to advertise the exhibit in local communities! The start of the new school year means excitement and learning for students of all ages. 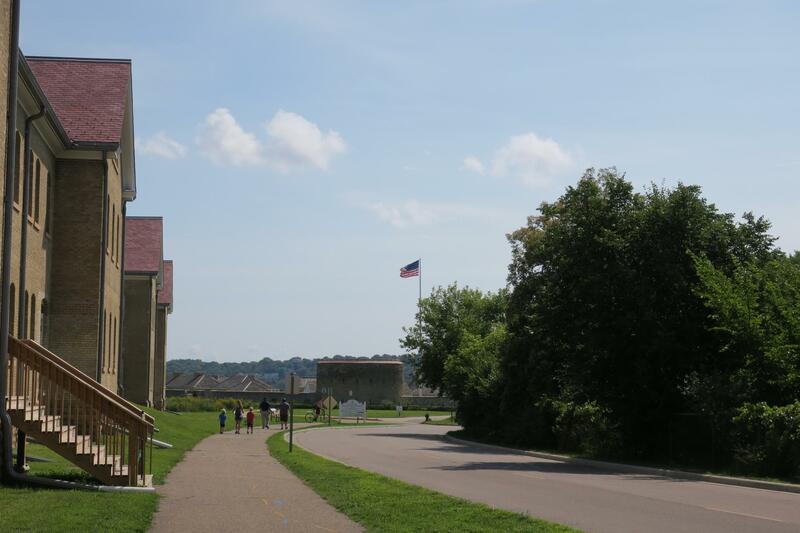 This year, it also marked the start of a new volunteer opportunity at Historic Fort Snelling at Bdote. A team of 18 volunteered as Field Trip Facilitators. Volunteers greeted and welcomed student groups, answered questions, provided a hands-on experience for students, helped extend the content of the fort by assimilating both general history about Fort Snelling and Bdote, and provided directional assistance and daily program information! Volunteer field trip facilitators served a total of 61 schools with 4,854 students and their 842 adults. MNopedia volunteer, Janet, wanted to write an article about the Grand Opera House for MNopedia, but couldn't locate many images. 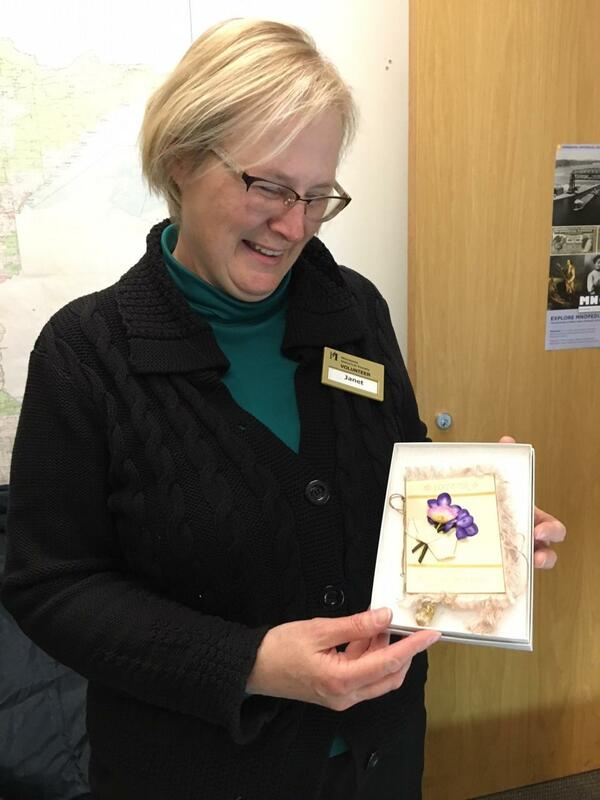 She found a wonderful article in the St. Paul Daily Globe describing the grand opening evening, including a detailed description of the souvenir booklet that was given to each of the ladies in attendance. She asked if there was one in MNHS collections, but no one could find one. Janet, who was in possession of a souvenir booklet, came to the rescue by generously offering to donate it. MNHS Collections & Research Services Program Associate, Lori Williamson, loved the booklet and immediately agreed to take it into collections. MNopedia volunteers make a habit of going that extra mile, but Janet has taken that a giant step further. She's a shining example of the best of the best MNHS volunteers. Intern Samantha has been working hard in the Collections and Research Services Division! Samantha comes to MNHS through Project SEARCH, a program that helps young adults with intellectual and developmental disabilities build job skills and prepare them for integrated, competitive employment in a wide variety of job fields. 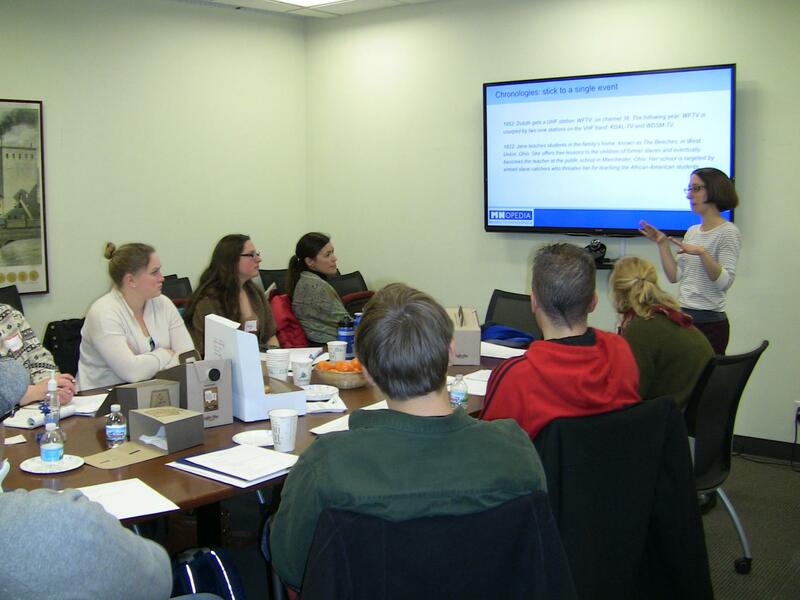 Throughout the one-year program, participants attend job-skill classes, complete three 150-hour internships, and receive on-the-job assistance from a job coach. Samantha has made huge progress in the three different projects she's tackling across the division. These jobs will make a big difference in our ability to preserve and provide access to our collections. Samantha has been rehousing St. Cloud State Reformatory Inmate Case Files preserved in the State Archives collection. By taking the case files out of their old, damaged folders and putting them into new, acid-free folders, the case files will last much longer and be easier for researchers to use. 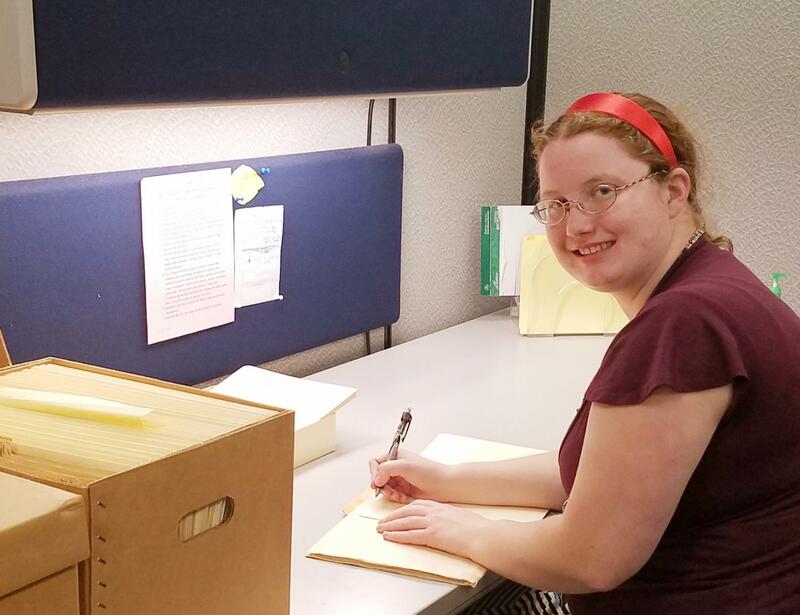 With over 1,000 boxes of case files in the collection, Samantha won't be finishing the project any time soon, but her work (and that of many other volunteers and interns like her) will pay off in the end! In Digital Collections Services, she's been taking scanned images of WWI Military Service Questionnaires and getting them ready for online access. This project involves some detailed technical work, data entry, and deciphering some pretty challenging handwriting on the historic records. While the job isn't easy, when it's done we'll be able to provide online access to these popular records -- not only will our researchers love being able to access these documents anytime, but it will also help the original paper records last longer by reducing handling. When she heads down to Level B to work with Collections Management, Samantha gets to help label and improve housing for objects. It can be time-consuming to line drawers with special foam or to place labels on the objects, but it comes with one very big perk: you get to have a up-close and personal look at our great collection of objects, including some of the most recently added items. If you're interested in learning more about Project SEARCH, visit https://www.projectsearch.us/. Summer 2018 Interns were busy all semester. 15 Interns worked throughout 10 departments across the Minnesota Historical Society (MNHS). Curatorial Assistant intern, Suzie, worked on many incoming 3D acquisitions over the summer. She wrote a blog post on student protest signs that came in after Parkland (donated by former TAG member Andrew Sandfort). The blog will be published soon to the MNHS Collections Blog. MNopedia intern, Elizabeth, made a significant contribution to MNopedia during her summer internship, writing four articles (one published, three in editorial) and fact checking one more. She joined the MNopedia team for two field trips in June - one to the LeDuc Historic Estate in Hastings and to the Hennepin History Museum and MIA. Elizabeth participated in the EPG Lightning Round Brown Bag and assisted with MNopedia outreach at two "Bands on the Boulevard" concerts in July. 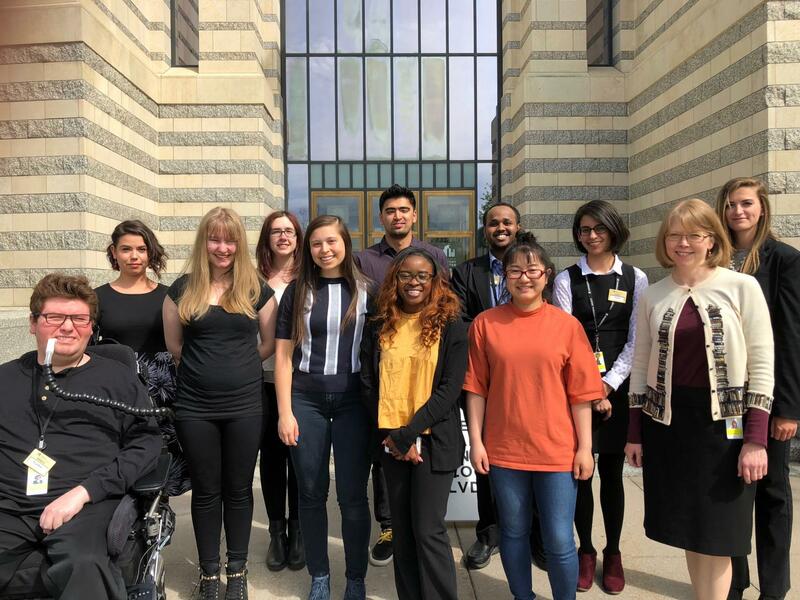 Inclusion and Community Engagement intern, Jae, helped to develop a learning and development toolkit about “Participating in difficult conversations.” He led a team of undergraduate researchers who developed the outline that will ultimately become the toolkit. The focus of this project was to instruct MNHS staff on how to have difficult conversations in a productive manner. Jae was integral to the completion of the project. Thanks to all our Summer 2018 interns who made significant contributions to the work and mission of MNHS!